(NaturalNews) The puppet Iraqi government installed at gunpoint by western imperialist nations is collapsing. 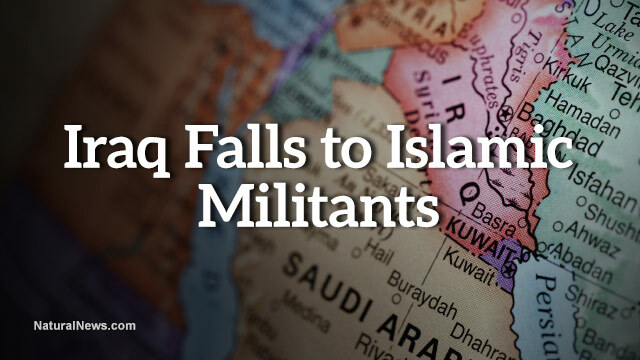 Iraq is now being overrun by the Islamic State of Iraq and Syria (ISIS). 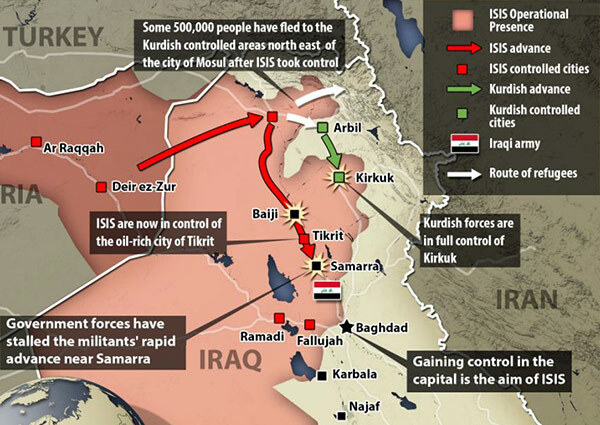 The oil-rich city of Tikrit has already been captured, and militants are headed for Baghdad, the capitol city of Iraq. The military surge has sent shockwaves around the world, shining yet another spotlight on the disastrously failed foreign policies of the United States and the Obama administration. While the U.S. military occupation of Iraq began in 2003 under President Bush, Obama pulled most U.S. troops from the nation in 2011, leaving behind a puppet government installed at gunpoint by the USA. That government is now on the verge of total collapse as armed, impassioned Islamic militants are rapidly overrunning the country. U.S.-backed Iraqi soldiers have no heart in the fight, and they are abandoning military equipment as they retreat en masse from the Islamic militants. ...30,000 soldiers fled, leaving behind tanks and firearms as just 800 fighters approached. Less than 24 hours later the oil-rich city of Tikrit was captured by the militants, who then turned their attentions to the capital as it pushes ahead with its aim to overthrow the western-backed government as part of its goal to create an Islamic emirate spanning both sides of the Iraq-Syria border. This is part of a global populist revolt that's only gaining steam. So we can all expect more outbreaks of such events around the world, but especially in areas steeped in cultural conflict such as Iraq, Israel / Palestine, Pakistan, North Korea and even China. Secondly, Iraq controls 10% of the world's oil supply, so everything that happens in Iraq impacts us all at the gas pump. But it's not just our own gas prices that matter; it's also the fact that higher fuel prices raise food costs at a time when food is already skyrocketing in cost across the world (due to extreme weather events, droughts, floods, GMO crop failures and so on). The surge of Islamic militants is panicking Washington, of course. America is a country weary of war and tired of all the deaths, injuries and costs associated with war. Iraq has always been a worthwhile strategic target for imperialist occupation, of course, because of its oil reserves. But the one rule of imperialist occupation is that you need to CONTINUE to occupy the nation if you hope to control it. Sure, the U.S. occupation of Iraq got us all another decade of cheap gas, but at what price for the war? After spending billions of dollars achieving an occupying military presence in Iraq, the U.S. foolishly thought it could leave behind a puppet government guarded by a few thousand half-hearted trained "government soldiers" who largely just wanted a paycheck. Those government soldiers obviously have no will to fight for a paycheck, and they are rapidly fleeing their positions and effectively turning over military equipment to the ISIS, which is rapidly gaining in strength and numbers. Remember, the USA invaded Iraq under a false "humanitarian" pretense, claiming it needed to "free the Iraqi people." (We were all ridiculously told the entire invasion had nothing to do with oil.) But "freedom" for the Iraqi people really meant subservience to a western occupying military. And that's something which can't be sustained long term because everybody across the world, no matter what country's they're from, resents occupying military forces in their own back yard. So as the U.S. reduced its military presence and posture, it was only a matter of time before local militants found the courage to organize a resistance effort which they characterize as a "freedom war" against the occupying imperialists, even describing it by invoking historical parallels such as Gandhi fighting against British rule. In truth, military occupation of a foreign nation is never a sustainable strategy. Nobody likes to be "occupied" by an army of foreigners wielding guns, tanks and attack helicopters. I'm not saying Iraq wasn't involved in some heinous human rights abuses long before the Americans showed up, but I am questioning the wisdom of the USA trying to occupy and control foreign nations to begin with. After all, we spilled a lot of blood over there, and lot of courageous Americans men and women gave their lives in that conflict. Now it all appears to be crumbling by the hour, with city after city falling to the ISIS and Baghdad close at hand. It brings up the big-picture question: Wouldn't all this have been less expensive, less tragic and less costly in human lives if we just focused on trading with foreign nations instead of invading them? Oh, I forgot: but then the weapons manufacturers wouldn't earn billions of dollars making new bombs, would they? Never forget that war is a for-profit business. And you can't profit from war unless you start one first.